We are now off the coast of Western Florida. After completing many stations in East Texas and Louisiana, we headed over to the Emerald Coast. State agencies in Louisiana and Mississippi, who are SEAMAP partners, have already completed stations in their states using the same trawling protocol which allowed us to push on to Florida. The change in species has been dramatic. We are now trawling in sandy bottom areas, which have also been shallower than most of our Texas trawls with muddy bottoms. Generally, the fish here in Florida have more coloration and our catches have been smaller with fewer, but often slightly larger fish. 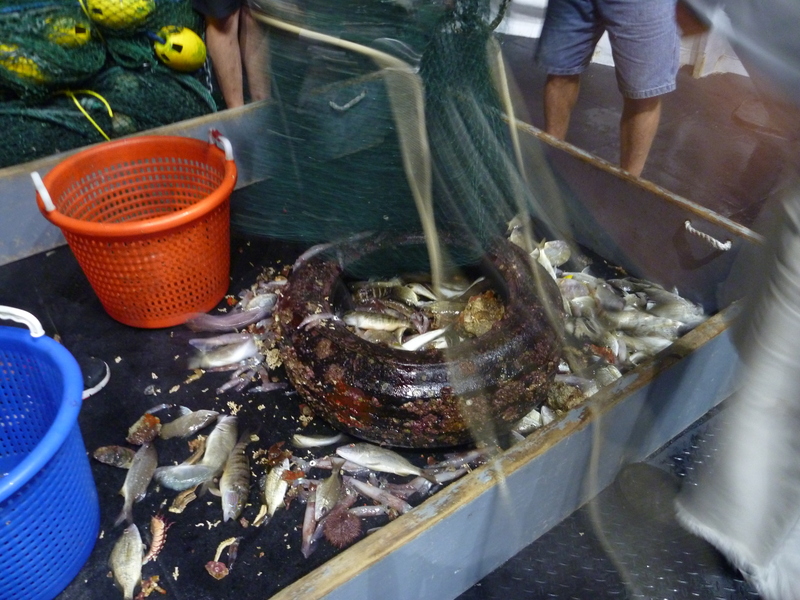 Below is a side by side comparison of fish diversity between a Texas trawl catch and a Florida trawl catch. The increased coloration in the fish actually helps the fish hide better in the sandy bottomed blue waters, yet at the same time allowing potential mates to find each other more easily. In the murky bottom waters of Texas, the fish tend to blend in better with duller colors. Here are some of the interesting species we found in the Emerald Coast waters. 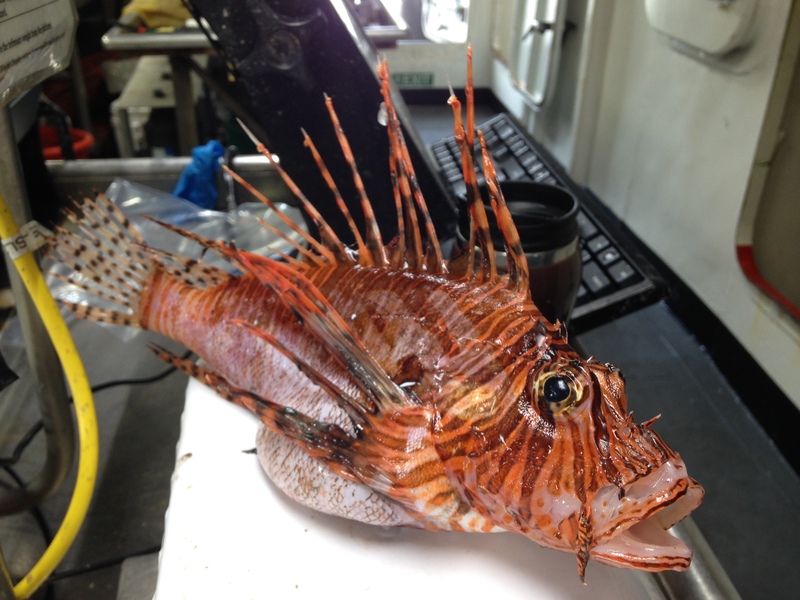 One new fish we have caught in Florida is the lionfish (Pterois volitans ). In less than 10 years, the Lionfish has become widely established as an invasive species in the US Southeast and Caribbean coastal waters. It is native to the Indo-Pacific region, but was introduced into this area of the Gulf. It is believed that lionfish were introduced off the Florida coast in the mid-1980’s, then expanded their way up the east coast. By 2004, NOAA scientists confirmed breeding populations off the coast of North Carolina which then worked their way into the Gulf of Mexico by 2005-2008. Lionfish are a popular aquarium fish and it is hypothesized that people released them into the Atlantic when they no longer wanted them as aquarium pets. Their large eggs masses floated up the coast via the gulf steam allowing them to spread easily. According to the National Centers for Coastal Ocean Sciences, it is estimated that their population has reached roughly 1,000 per acre in some locations of the Gulf. Lionfish are top predators which compete for food and habitat with native predators that have been overfished like snapper and grouper. I’ve spent some time talking with people who work on the ship from the different departments trying to understand their jobs and their desire to work at sea. I have posted three interviews in my previous blog and have three more to share with you here. Captain Nelson’s number one responsibility is safety on board. He is also responsible for the operations, such as getting the data that the scientists need. Additionally, he has a significant teaching and mentoring role for the Ensigns, new Officers. He is one of only two civilian captains in the NOAA fleet and has been training junior officers for 15 years. In 2016, the Oregon II won NOAA Ship of the Year, partially due to the culture that Captain Nelson has cultivated on the ship. Since he worked his way up from the deck, he really can appreciate the role that each individual on the boat plays and says it is critical that everyone works together for the safety and the success of the science mission of the ship. What did you do before working for NOAA? After high school, I fished commercially and worked as crew on oil field supply boats. 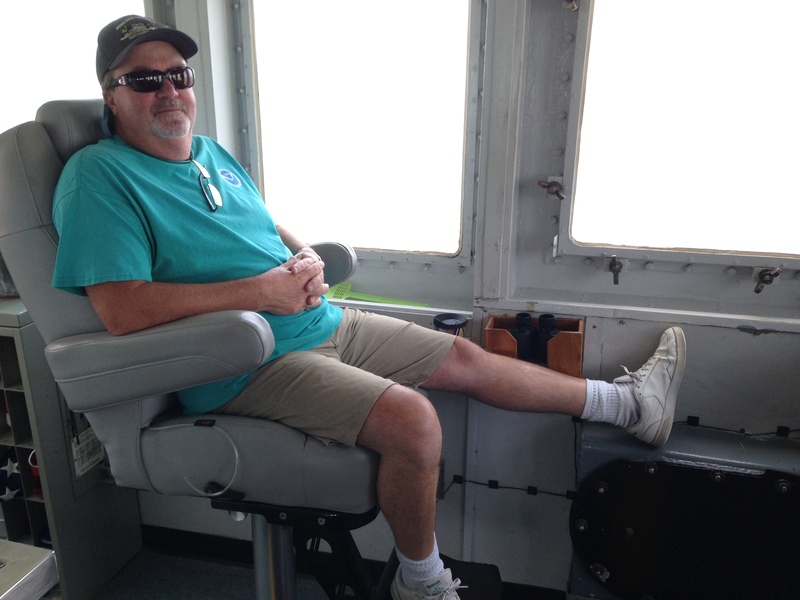 I captained a shrimp boat, but knew I wanted to find a career. I started as a deck hand and worked my way up to Third mate, then Operations Officer (OPS), Executive Officer (XO) and finally Commanding Officer (CO) over the course 25 years. I had all the nautical knowledge and NOAA gave me the opportunity to take the Master Captains License test. I had to go back to the books to study hard and then passed with flying colors. What do you enjoy most about working on the Oregon II? I enjoy training the Junior Officers and seeing them make progress. And of course, the joy of going to sea. What advice or words of wisdom do you have for my students? Set a goal and stick to it. Don’t let anyone get in your way. At 47, I had to go back to the books and study harder than I ever had for my Master Captains exam. There will be set backs and hard work will be required, but sticking with your goal is worth it in the end. 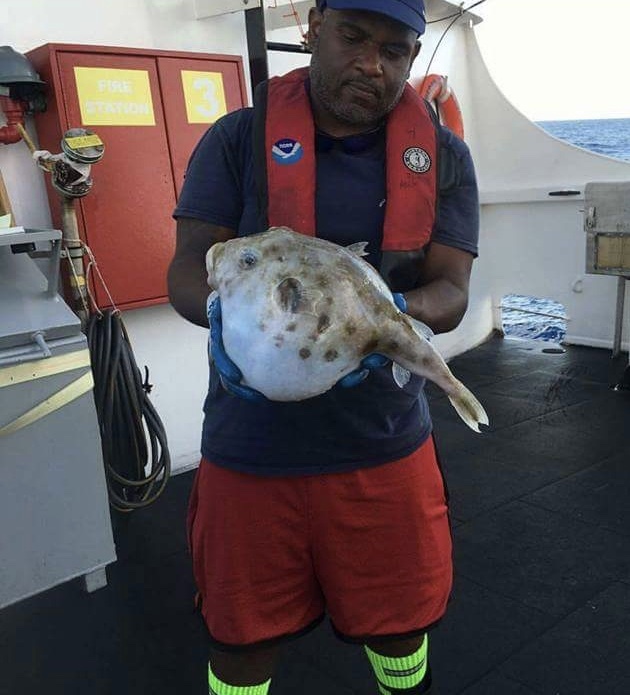 Andre has been working at the NOAA Mississippi Lab in Pascagoula as the education coordinator and a member of the trawl unit for 21 years. He has been working on the Oregon II for 19 years. When at the lab he coordinates the education interns, collects and compiles trawl data and compiles historical trawl protocols. He is also the foreign national coordinator and get them cleared for sea duty. I’ve worked closely with Andre on the boat and appreciate all his patience and willingness to share his knowledge and insight with me. What does it mean to be Science Field Party Chief? I am the liaison between the lab and the ship and help mediate requests from both parties. On board, I supervise all scientific activities and personal. My degree is in general biology, which I linked to aquaculture. Right out of college, I worked at the Sea Chick aquaculture plant raising large mouth and hybrid striped bass. The facility was trying to make farmed grown fish as important as farmed raised chicken. I was hired as a temporary scientist for a Groundfish survey for 40 days aboard NOAA Ship Chapman. After that, I worked with a Red Drum tagging crew aboard the R/V Caretta then was hired on permanently by NOAA and been working at the lab ever since. Tell me about one challenging aspect of your job? Being out at sea. I miss my family and my normal day to day life. Going to sea. Even though it is hard to be away, I love being out there and the work we do. The goals that you desire may become your livelihood, always make sure to make your work fun and it will never bore you. 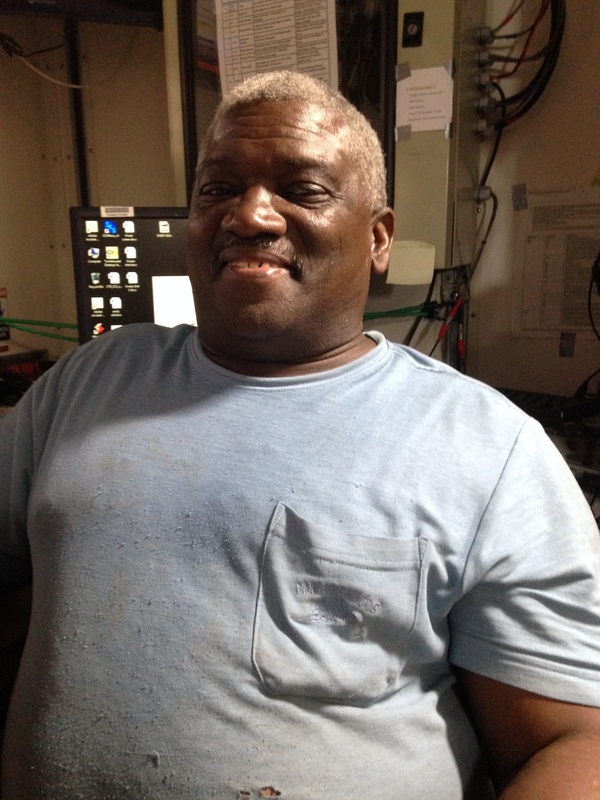 Darnell has been the Second Engineer aboard the Oregon II for three years. His job is a critical one as he is responsible for the maintenance and upkeep of the engines and generators. We are typically running on one engine and one generator with a second of each for back up. He changes filters, checks oil sump levels and makes sure everything is running smoothly. I worked in the Navy for 20 years as an engineer doing repair as a machinist through three wars. Then I worked doing combat support for the military sea lift command. A friend told me about a job opening on a NOAA ship. I applied and got it. I’m used to working on much bigger ships, so working on the Oregon II is like working on a lawn mower in comparison. I tackle problems in a routine way and solve them as they arise. Working on this ship is new and interesting, which I like. I’ve seen some weird stuff come out of that water and enjoy learning about the science that is happening onboard. If your mind is set on something, proceed on that road and keep persisting. Stick with your goal. It’s the 4th of July and folks are getting patriotic on the Oregon II. The ship got a new flag today and we had festive lunch, which is typically the biggest meal on the ship due to the shift change. The day shift folks eat first and then start their shift, while the night shift folks end their shift, eat and head to bed. Yesterday we saw land. It has been 10 days since I’ve seen hard ground which is a lot for this land lover. I’m not sure why, but for some reason I imagined we would be close enough to see land more often. However, it was strange to see beach hotels and condos at a distance today; we are between 3.5-8 miles off shore for a few of our stations. I’ve come to enjoy the endless sea view. While trawling yesterday we caught a tire. We’ve actually found very little trash in our trawls, so the tire was a bit of a surprise. Then we caught another tire in the next trawl. Apparently, it is common for people to dump tires and other large trash items into the ocean and GPS the location. These items are used as fish aggregating devices. Vegetation will grow on them and attract small fish. Larger fish are then drawn to the area to feed. Using the GPS location, people will come back to fish this area. I guess it is helpful that we are picking up the tires. It is hard to believe that I am almost at the end of my journey. We’ve finished our trawling and are making the trek back to Pascagoula, MS. It feels strange to be awake with no fish work to do, but I’m enjoying a little down time as it has been a busy two weeks full of fun and learning. The northwest coast of Florida from Pensacola Beach to Panama City Beach is referred to as the Emerald Coast, which is where we are now. According to the Northwest Florida Daily News, the term Emerald Coast was coined in 1983 by a junior high school student who won $50 in the contest for a new area slogan. Of all the fascinating new species I’ve seen, I think lionfish are the coolest and craziest organism of them all. I also find it interesting that a native species in one area of the world can be problematic and invasive in another part of the world. There are several reasons when we have explored so little of the ocean. One main reason is that ocean exploration is expensive, roughly $10,000 per day. Fish and other aquatic organisms are concentrated by the coast, so that is the area that is prioritized for exploration and where our major fisheries are located. Most of the fish that come aboard end up dying for the purpose of science. I would estimate that in a typical trawl we have might pull in between 250 to 300 organisms. This is a pretty small amount when compared to the amount of fish removed by the commercial finishing industry and the unintended catch associated with the fishing industry. We often split the catch and end up sending half of the organisms back into the ocean fairly quickly. However, the ones we keep aboard give us important data that allow fisheries manager to assess the health of the fisheries in their states. We also keep and freeze certain species for other researchers who will use them off the boat. Ultimately the ones we don’t keep are returned to the ocean and will be eaten by larger fish and marine mammals. 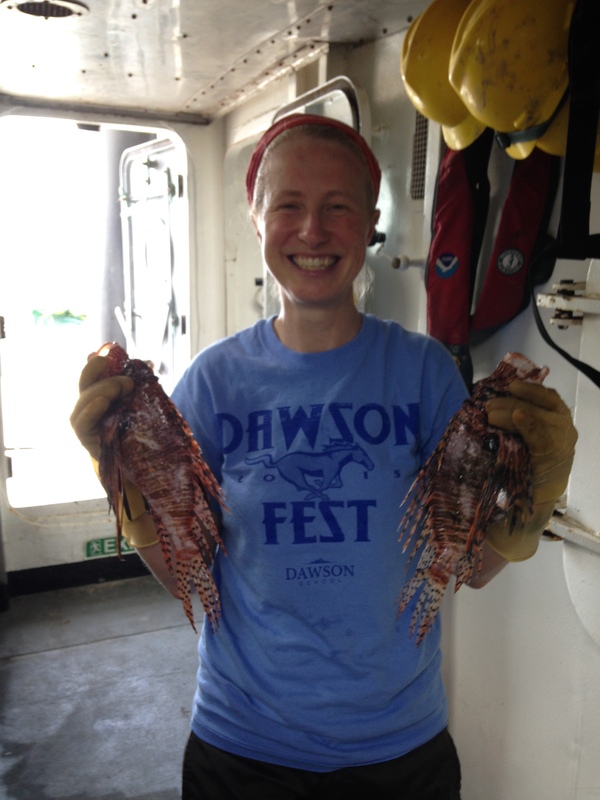 This entry was posted in 2017, Melissa Barker, NOAA Teacher at Sea and tagged Emerald Coast, Florida, groundfish, Gulf of Mexico, lionfish, NOAA Ship Oregon II, trawl. Bookmark the permalink.